Locals and visitors treasure Gatineau Park. 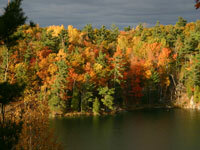 Located just 15 minutes from downtown Ottawa, it is the capital's conservation and matchless outdoor-recreation haven. Travellers can expect a fun menu of activities, regardless of which season they arrive in. Swimming, hiking, biking, camping, cross-country skiing and snowshoeing are all on offer within an area renowned for its hilly woodlands and clear lakes. Visitors typically enjoy exploring the beautiful Luskville Falls, the diversity of forests along the King Mountain Trail, and Lusk Cave: a marble cave and geological phenomenon. Gatineau Park is definitely worth a full-day trip.